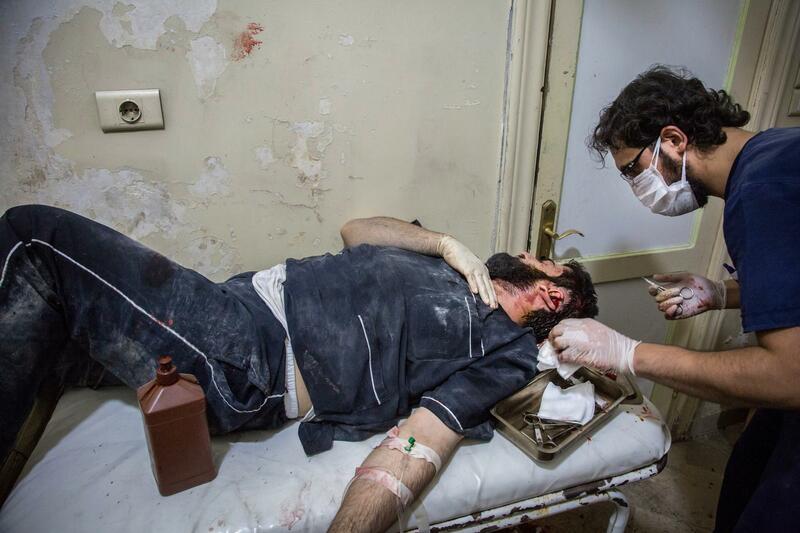 As intense airstrikes resume on east Aleppo, we spoke to a doctor in one of the besieged area’s few hospitals. Up until Monday, the situation in east Aleppo had been relatively quiet for some weeks, with just light shelling. 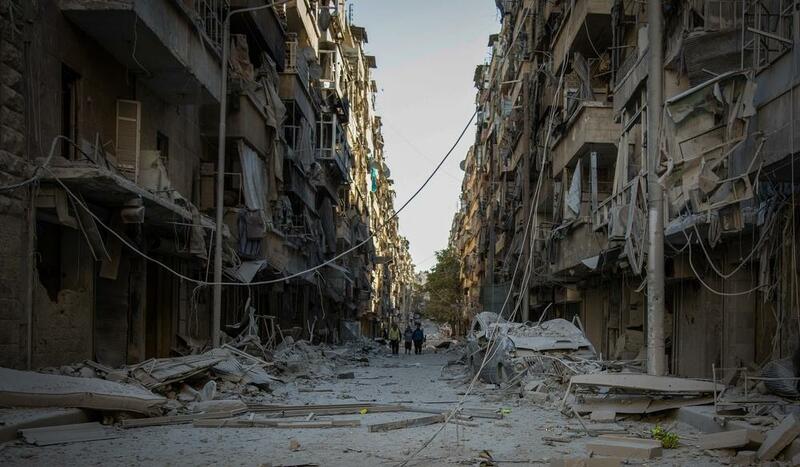 But on Tuesday the situation suddenly escalated, with more than 100 raids and scary numbers of people wounded. 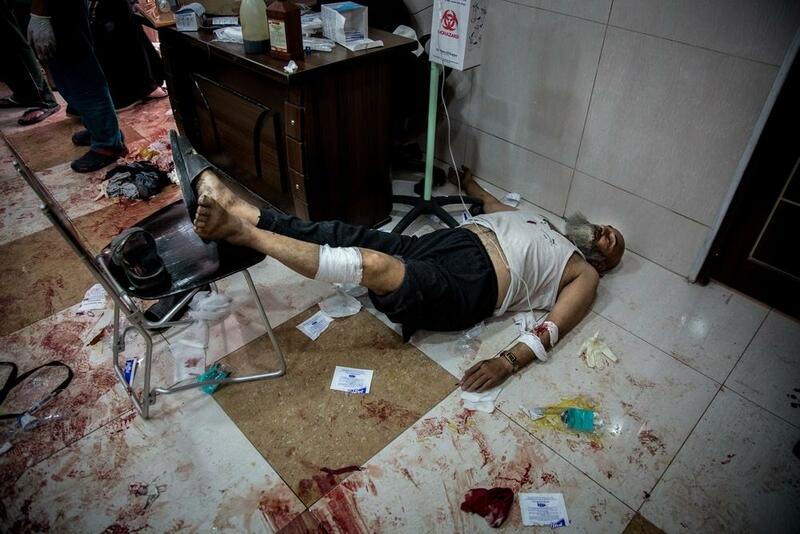 "In just two hours, between 1 pm and 3 pm, 55 wounded arrived at the hospital. We admitted 13 people and three people died; the rest we sent back home. The wounded have all kinds of injuries, from superficial wounds to limb injuries to neurological injuries. When there are massacres going on outside and large numbers of wounded, we stop everything else to concentrate on treating the injured. Non-urgent operations can be postponed, until the shelling has stopped or the surgeon has more time. Patient lies on a hospital floor after being injured in the leg by shrapnel from cluster bombs while queuing up to buy yoghurt in the Bustan Al Kasr neighbourhood of east Aleppo. Doctors said he needed surgery or a cast, but as his injury was less severe than many of the 60 other wounded people needing attention, he had to wait his turn. "There’s too little time and too few doctors"
When it’s quieter, we can monitor patients for longer, but in bad situations like the one now, we have to discharge them an hour or two after they’ve been operated on. The most vulnerable patients are the ones with head wounds and neurological injuries – 70 to 80 percent of them end up dying. We see a lot of people with limb injuries, but usually we can’t do anything for them and it ends in amputations. There’s too little time, and too few doctors, operating theatres and medications. We don’t have many options. On Tuesday, one shell fell about 20 metres away from the hospital, but we weren’t hit. People walk down a street in Bustan Al Kasr neighbourhood after it was hit by airstrikes in mid-October 2016. In the past five months, we’ve been targeted five times: once in June, twice in July and twice in September. Each time, we shut down for a few days, to do essential repairs and clean the place up, and then we reopened our doors. Frankly you can’t do much to prepare for a bombardment like this. Early last summer we started to excavate under the hospital but, when the siege started, we couldn’t get hold of building materials, so we had to stop. We began to build a wall around the hospital, too, but we haven’t been able to finish that either. Our generators are all far away from the hospital, in a relatively safe place below ground level, but the fuel to run the generators is about to run out. Some medications – such as those for chronic diseases – are already finished. Some painkillers and antibiotics are beginning to run out too. 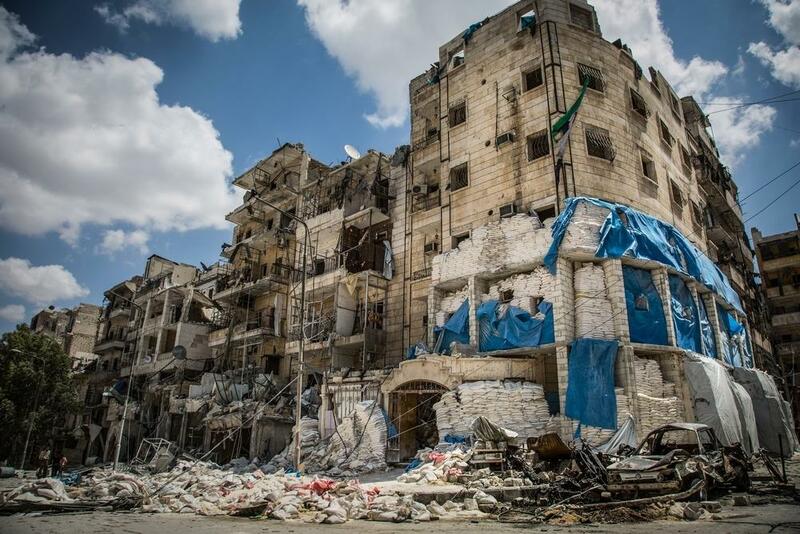 As the intensity of the bombing increases and the massacres become more frequent, we are seeing more and more patients, and so we are getting through supplies faster. When you have wounded patients, you can’t keep medications back for later. Treating people’s injuries is our first priority and is more important than anything else.